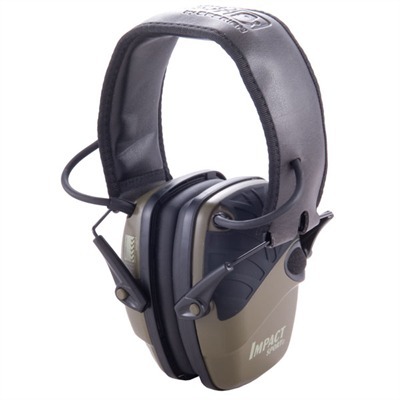 The Howard Leigh Impact Sport Electronic Earmuffs offer compact, lightweight electronic hearing protection allowing you to hear conversations and range commands, while blocking out dangerous noises like gunfire. 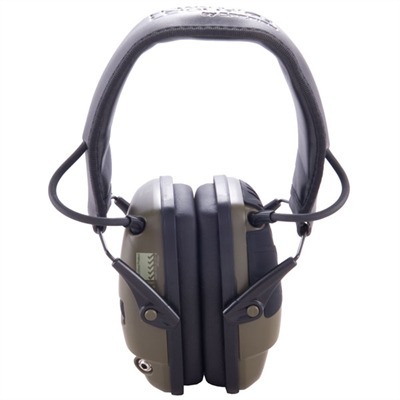 Internal ultra-fast response electronics amplify ambient sounds to a safe 82 decibels (dB), yet shut down when sounds above 82 dB are detected to let the muff’s passive hearing protection take over. When the earmuffs are in amplification mode, directionally placed stereo microphones even help you hear where the sound is coming from. Built-in AUX input accepts 1/8" (3mm) stereo plug (patch cable included) to connect an MP3 player, radio, or other audio. The Impact Sport Electronic Earmuffs feature an automatically shut-off that activates after 4 hours to preserve battery life. Bottom half of the low-profile ear cups angles in sharply to ensure plenty of clearance when shouldering long guns. Cups fold up neatly into the adjustable head band for convenient storage.